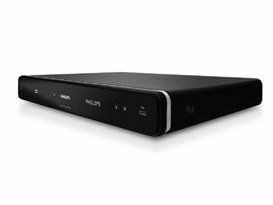 Philips has revealed that its much-anticipated BDP7300 Blu-ray player will be out this month for the reasonable price of £249. Originally announced back in February, the BD-Live machine boasts a speedy start-up time, low power usage and 1080p 24fps Full HD output. Sound-wise, the BDP7300 supports both Dolby TrueHD and DTS Master Audio Essential 7.1 decoding and there's also 1GB on-board storage included to satiate the needs of the Profile 2.0 functionality. As is now common place on many Blu-ray players, a USB 2.0 slot has been included, so you can also pipe your own files into the system to playback. File compatibility includes: WMV, MP3, WMA and JPG. It will also recognise your AVCHD recordings – so you will be able to view your dodgy holiday movies through the player. Philips also revealed back in February the BDP5000 and BDP3000, but there's still no information as to when these players will see the light of day. For more information go to www.philips.co.uk.